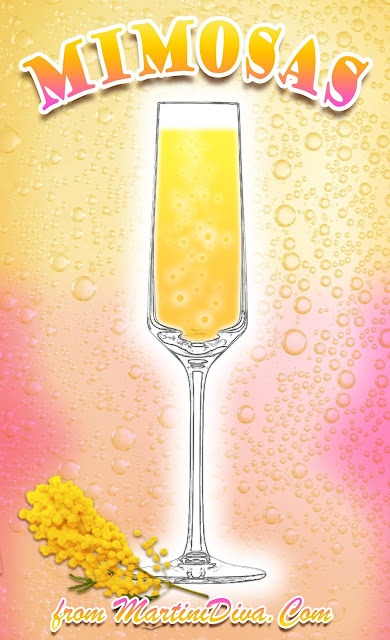 The Mimosa is a modern day cocktail classic composed of equal parts Champagne and citrus juice (most typically orange juice) which enjoys widespread popularity as a brunch starter. 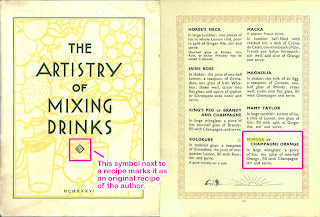 It is widely accepted that the Mimosa was created in 1925 at the Ritz Hotel in Paris by bartender Frank Meier, although in Meier's own book, The Artistry of Mixed Drinks (p. 1936), he does not lay claim to the drink with his book's "created by" symbol. Originally the Mimosa was served over ice in a large wineglass, today's version is a straight up cocktail served up in a flute glass. Named after the Mimosa flower (which looks a little like a cluster of Champagne bubbles), it is a variation of the Buck's Fizz, created in 1921 at the Buck's Club in London by Pat McGarry, which is made with two parts Champagne to one part orange juice. The Grand Mimosa, served with the addition of a bar spoon of Grand Marnier. The Puccini uses Mandarin orange juice. The Poinsettia which is made with cranberry juice. The Megmosa which uses grapefruit juice and, sometimes, a splash of Cointreau. The Soleil which uses pineapple juice. The Bellini, substitutes peach puree for the orange juice. 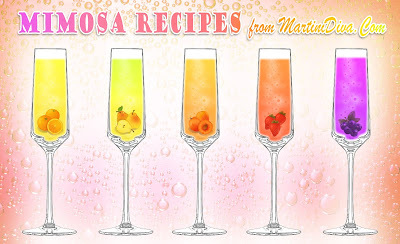 You can substitute nearly any fruit juice for the orange and end up with a lovely Mimosa variation. My personal favorites include pear juice, blueberry juice, pomegranate juice, cherry juice and strawberry juice, all freshly squeezed or sent through my electric juicer and I've been know to grill and mix my juices as well. You can also substitute other sparkling wines like Prosecco. Additionally, I often add in a few drops of complementary bitters, though technically this is a Champagne Cocktail element. Basically any fresh fruit juice topped off by Champagne or a sparkling wine can be called a Mimosa these days. Add the fresh orange juice to your chilled glass and top off with chilled Champagne. Do not stir. It's that simple. Merry Mimosa Martini Sparkling Pumpkin Cocktail National Mimosa Day is May 16th.